The Camera Obscura offers an all-round view of the Jacaranda City and on a clear day, it is even possible to see miniature cars climbing the pass in the Magaliesberg. Bookings of 5 - 10 people are essential. Camera obscura is a Latin term which literally means dark room. And that is exactly what you will experience when you visit the Camera obscura - a dark room with an instrument consisting of lenses and plane mirrors. Having been originally developed form the pinhole camera Sci-Enza staff will explain and demonstrate the pinhole camera as well as camera obscure. The principle of the pin-hole camera has been around since the ancient times and was described in Chinese records dating back to the fifth century BC, as well as by Aristotle in the fourth century BC. A hole in the wall of a dark room between an object and a screen will arrange the light reflected from the object in such a way that an inverted image will be formed on the screen. A large hole will give a fuzzy, but a bright image, while a smaller hole will improve the sharpness of the image, but decrease its intensity and brightness. When a converging lens is placed over a relatively large hole, an image is obtained which has the sharpness of a small hole and the intensity of a large hole. The image formed is still inverted and the simple lens tends to distort the edges of the image. One of the earliest references to the use of a lens in the camera obscura was made by Girolamo Cardano, a professor of mathematics in Milan in the 16th century. The camera obscura was used extensively from the 15th century onward by artists as an instrument to copy images onto paper. This application led to the design of many different types of portable instruments. 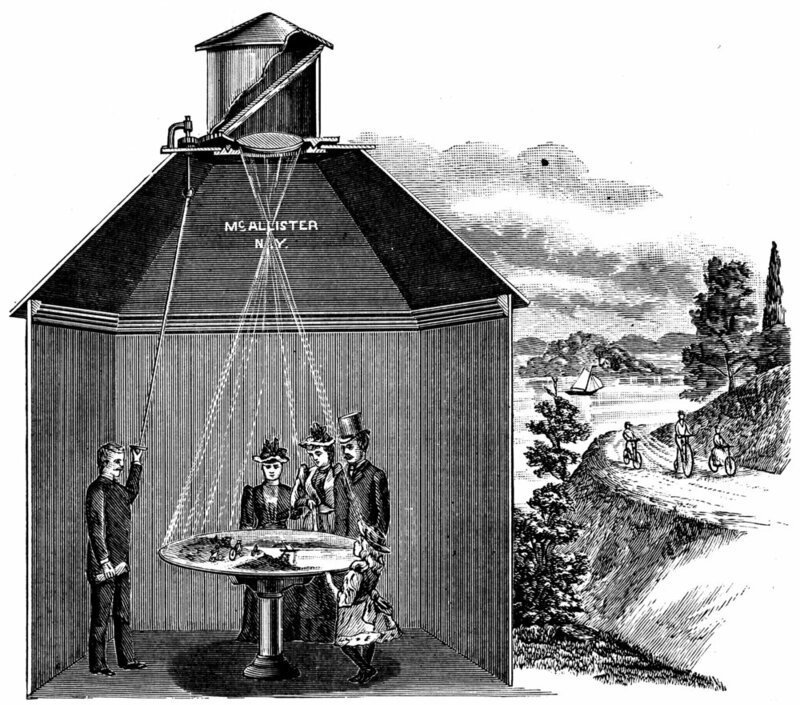 During the 18th and 19th centuries many camera obscuras were also erected as permanent buildings and used for military, astronomical and meteorological observations, and also as tourist attractions. By then a mirror had been introduced into the system to direct the image either to the lens or from the lens to a screen. 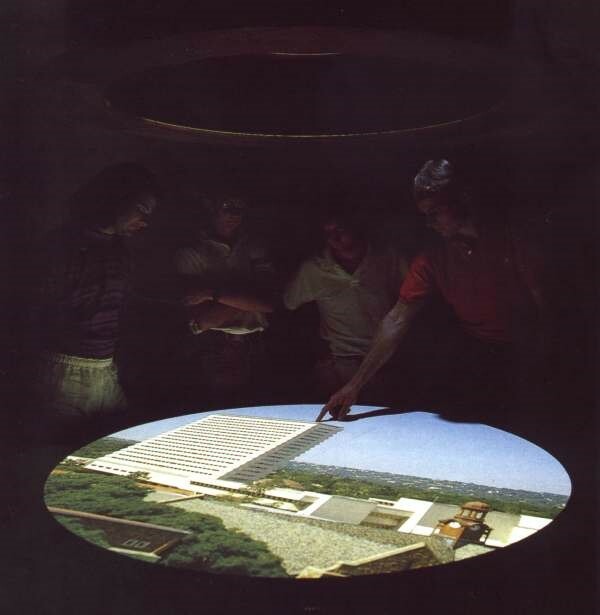 The camera obscura at Sci-Enza was completed in 1990 by the South African optical firm, Eloptro. According to Prof Lötz Strauss, former Professor of the Department of Physics no other camera obscura has a better lens system than Sci-Enza’s. As the lens system consists of three elements and projects a huge undistorted image of very high quality onto a flat horizontal screen. The most striking aspect of the image on the viewing table is viewers can see people, cars, birds and aircrafts moving. The light enters the room by means of a special plane mirror which is housed in an adjustable turret that can be turned through 360°. From the mirror, the light enters the lens and creates the image on a flat circular screen which can be moved up and down to facilitate focusing. By adjusting the direction of the turret, a different view of Pretoria becomes visible on the screen. Towards the east, the hills in Faerie Glen, the Menlo Park tower and Strubenkop, as well as everything in between, are clearly visible. The city centre is best viewed in the morning when it is illuminated by the sunlight from the east. The images of the official residence of the State President and the Union Buildings are of such high quality that the colours on the flags can be clearly distinguished. On a very clear day, it is possible to see vehicles on the pass in the Magaliesberg which leads to Pretoria North. It is only on seeing these very sharp images on the viewing table that one suddenly realises that one is actually standing inside a large camera in the very position at which the images would in an ordinary camera be transposed onto the photographic film. The camera obscura is best experienced on clear days.